Lung diseases are one of the most serious conditions gripping our country. Most of the times, human activities like smoking and other activities that aggravate the air pollution contribute to these deadly Lung diseases. 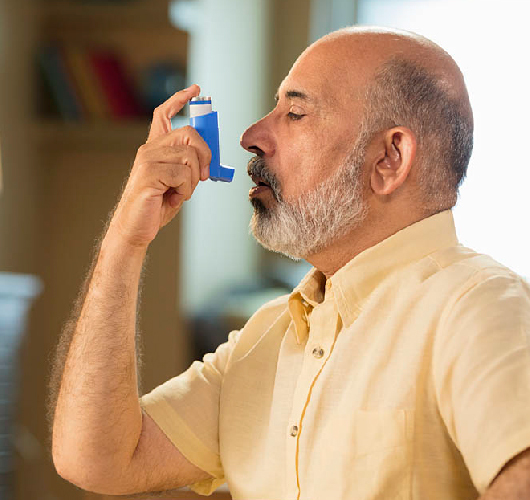 Our pulmonary rehabilitation services include providing excellent care for asthma rehabilitation, copd rehabilitation and lung rehabilitation among others. Our comprehensive, interdisciplinary team approach (i.e. care being provided by various disciplines in a coordinated fashion) with Physician (Physiatrist), Physiotherapist, Occupational Therapist, Neuropsychologist and a Nutritionist can help reduce your symptoms directly related to the illness as well as prevent medical complications that occur as a result of impaired mobility such as blood clots in the veins of the arms and legs, blood clot in the lungs, and pressure ulcers. Pre-requisite to starting rehabilitation, it has to be ensured that the medical issues have been addressed by the Pulmonologist and is in compliance with the recommended medications, and oxygen or non-invasive ventilation such as BiPAP, CPAP (if necessary) and measures such as quitting smoking. Not all patients will require all services and usually, a combination of these services is required for an individual patient. You will be evaluated at the initial visit to determine what services you require and a tailored treatment plan will be initiated. First patients will be evaluated by the Physician to determine the severity and chronicity of the respiratory condition and it’s impact on the patient. The Physician then designs an individualized treatment plan. A Pulmonary Function Test is often helpful to understand your lung capacity prior to beginning treatment and may be requested if not done already. The treatment plan primarily includes physical exercisesand adequate nutrition. However other treatments like training for an occupation, activities of daily living, and psychological counseling can also be recommended depending on the severity of the physical limitation and prognosis. The Physiotherapist trains patients on a variety of exercises like breathing exercises to reduce dysfunctional breathing pattern and improve breathing capacity, passive and active secretion management techniques to reduce mucous plugs, exercises to improve respiratory muscle strength, and finally, aerobic exercises and muscle strengthening exercises to improve overall strength and endurance. They also focus on energy conservation strategies. A Neuropsychologist evaluates patients with depression and anxiety that is commonly seen after any major life-changing illness guides them through the process of rehabilitation thereby improving their quality of life through motivation and counseling. As adequate nutrition intake is essential for optimal recovery, the Nutritionist recommends an appropriate intake of nutrition. The goal of this program is to improve lung function, reduce symptoms such as fatigue and breathing difficulty, manage secretions (phlegm) better and improve breathing capacity, muscle strength, and endurance. It also helps to improve walking and perform other physical activities more efficiently. Studies have shown that pulmonary rehabilitation program can decrease complications and hospitalization caused due to pulmonary conditions.